It was projected by Giovanni Lotti (1806-1881), is located in the historical center of the city e was dismessed in 1982. 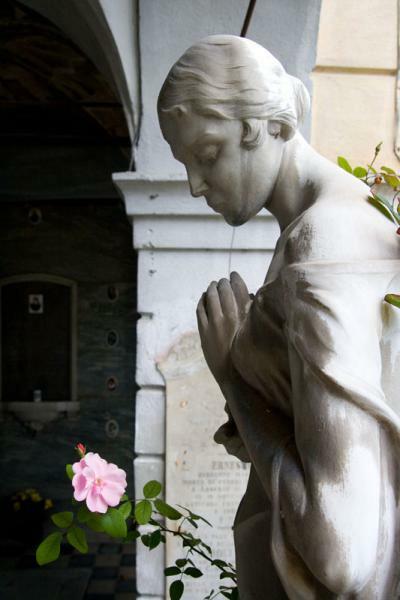 The historical and artistical features and the presence of valuable ceramic manufactures realised in the 19th century include it in the most interesting cemeteries in the district. The municipality has commissioned to Arch. Vincenzo Vandelli a project in order to save and enhance the cemeterial area and promoted, since 2007, several cultural initiatives, as sightseeing, the making of a short film ("Miserere. The San Prospero's monumental cemetery"), concerts (all included in the brochure here attached) and it is going to organize, even in this year, several initiatives: lectureship of art history between 2nd and 8th of June (european week of cemeteries), a Diego Cuoghi's exhibition with pictures of San Prospero cemetery and a guided tour of it, to ending in the month of November (approximately near november 2nd ) with a coral concert, the public presentation of the guide and the salvaging project. Cemetery of Sassuolo "San Prospero"
Oglejte si Cemetery of San Prospero (Sassuolo, Italy) na večjem zemljevidu.